Two thieves in West Chester were caught on video stealing a lion statue from a home. The statue was returned within 24 hours and the thieves also left a bouquet of flowers. A lion statue heist conducted over the weekend near West Chester University, carried out by two would-be criminals, ended with an apology and a bouquet of flowers. 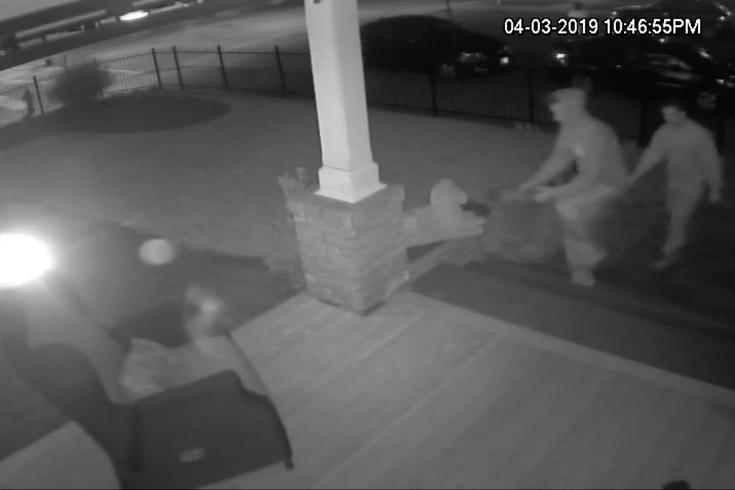 The West Chester Police Department posted a video on Friday night of two seemingly college-aged thieves-in-training stealing a lion statue off the front porch of a home near the university's campus, cementing the duo's names in petty-crime history as the "Lion Statue Bandits." The video quickly went viral on Facebook. But the weekend did not end— nay, not even 24 hours passed – before police uploaded more video showing two similar looking males (we can't confirm it was the same dynamic duo, but we're assuming) putting the statue back, along with a bouquet of flowers and an apology card. "So ... Soon after we posted the video of the lion statue being taken from a residence in the Borough, it was returned ... with flowers and a card," police said in the second Facebook post. "We thank everyone who shared the video and to the two fellas, smart move to return the property. The owner is grateful the statue was returned." The initial video was recorded after 10:45 p.m. on Friday, and you can see the two thieves – one in a hoodie, one not – linger outside the home's gate, make a move for it, then retreat when a car drives by. Very ~stealthy~. After one thief determines a stone lion statue is heavy, it becomes a two-man job. Together they grab the lion and skidaddle out of there. Skidaddle is the only verb I will use to describe their getaway. Then, at 10 p.m. the following night, they're back for the return. This time both would-be crooks have the sense to cover their heads with hoods. The lion statue did not make it all the way back to its original perch, but one of the men tenderly lays a bouquet of flowers upon the front steps.